A snap update of the current laboratory-confirmed numbers of influenza-infected people in Australia as we move to halfway through the autumn month April in the southern hemisphere. 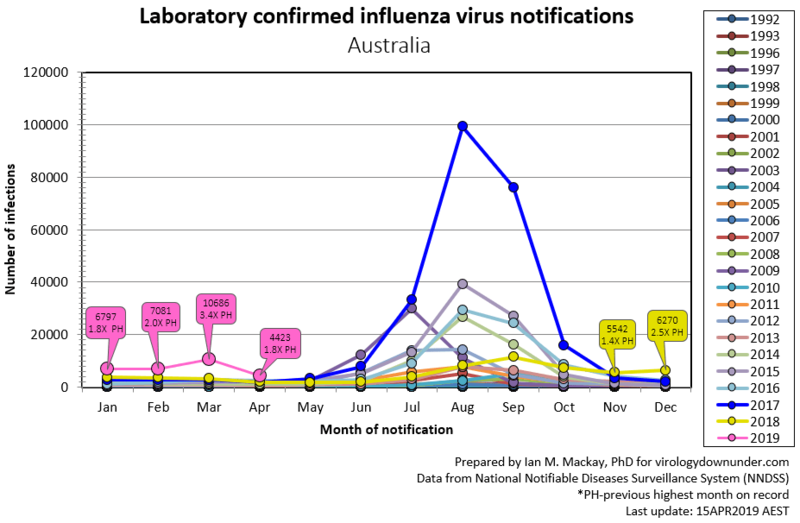 Laboratory-confirmed Flu (“notifications”) cases in Australia. As can be seen, the current high levels continue on from the strangely high hot weather Flu numbers that began in November 2018. Nationally, Australia has recorded 4,423 notifications, which is 1.8 times the previous highest April on record (2016 at 2,432 notifications); and national records go back to 2001 (yes, testing methods & reasoning has changed in that time). Where this season is going is anyone’s guess. Speak to your Doctor or Pharmacist about when best to get vaccinated.